Bio: A graduate of New Mexico State University, Nathan began his professional career at the NMSU Golf Course in Las Cruces. 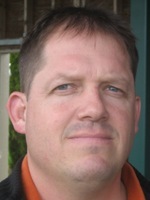 He relocated to Bellingham in 1997 becoming an Assistant Professional at Sudden Valley. A year later he moved to North Bellingham where he has been for the last 13 years, 12 of them as Head Professional. In 2008 Nathan began coaching the Meridian HS boys golf team. The typical golfer’s instincts tell him that gripping the club tightly and hitting the ball as aggressively as he can will send it further down the fairway. But the typical golfer has to restrain this impulse to grip it and rip it as the principle is sadly flawed. Rarely will anything good come of it, in fact. The golfer who has never gripped the club tighter and jerked it away from the ball quicker in the hope of launching it an extra 20 yards, simply doesn’t exist. It’s entirely natural to take a tight hold of the club and swing faster when you want to hit it further. But so simple, and seemingly innocent, a move as gripping the club tightly has a profoundly negative effect on your swing and, in turn, your shot. By squeezing the grip harder and clenching your teeth (Image 1), your forearm’s muscles inevitably contract, becoming less flexible. That rigidity transfers all the way up your arms into your shoulders which can no longer make a full and uninhibited turn. Instead you make a stiff, shortened backswing with no fluidity or tempo (Image 2). 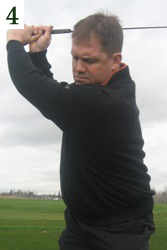 At impact, your forearms fail to turn over which means the clubhead cannot be released properly. So instead of hitting it further you actually lose distance and promote a push or slice…or, worse, a push slice. Your hold of the club should never be loose or sloppy, but it must be light. You might have heard it said you should hold the club with the same force you would use to hold a bird. But how often do you hold a bird? It’s not a great image. I suggest thinking of a scale from 1 – 10. ‘1’ is the level of tightness at which someone could easily remove the club from your hands, while 10 is a vice-like death grip. Grip the club at level 3 or 4 (Image 3). You’ll find that your forearms and shoulders relax, allowing you to make a full turn (Image 4). Your swing will have better tempo and be better synchronized (arms, upper body and lower body turning back and through in harmony). You will also release the clubhead through impact resulting in a little right-to-left drawspin and those precious extra yards.